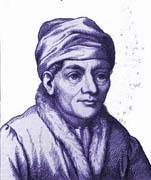 X- Most prominent is Saturn in Virgo close to his Midheaven. (Saturn is conjunct Juno, of which more later). Here is a man destined to fill a seat (ponder of the symbol for Saturn) of power. What kind of power? Virgo has many aspects and meanings, but military is certainly one of them. (Virgo rules the military.) Benjamin (Bibi) spent many of his early years as a commando in an elite and secret Israeli military unit. He made his name there and was helped along the way by the death of his older brother Yoni during the rescue of Israelis at the Entebbe airport in Uganda in 1976. These parts of Netanyahu’s life mirror his horoscope. X - By his given birth time, his Ascendant is set at 0.27 Sagittarius. The symbol of Sagittarius suggests his innate warrior nature. The glyph also points to his Midheaven. Three minutes difference on his 9:30 am birth time (9:27) gives him a 29+ degree Scorpio Ascendant. The author believes Netanyahu warrants having a dual Ascendant both of which have warrior implications. The State of Israel (like the USA) has a Scorpio Ascendant as well. Netanyahu’s history - and that of his country and his race - is one of continuing battle, wars and conflict. By horoscope and biography, it is more than likely that this pattern will continue. Another round of martial turmoil in the Middle East with Benjamin Netanyahu at center appears at hand in the near future. X - Bibi has a Stellium of planets and South Node (5 total) in his 11th house, all in Taurus and within 12 degrees. This Stellium depicts much of his dynamic nature, determination and tenacity. Netanyahu is most certainly a Bull personified, with many of its positive and negative aspects apparent. Netanyahu has succeeded on two occasions now to become the Prime Minister of Israel. And, it is quite apparent that his present goal is not just maintaining his country’s security, but neutralizing what he considers the Terrorist State of Iran. X - PM Netanyahu has an intimidating Grand Trine between houses 1-5-9 coming into play in this scenario. The fiery entities placed in naturally fiery houses are visioning Venus and healer-vs-destroyer Chiron in high-minded but combative Sagittarius, and explosive Pluto (sharing the 9th with aggressive Mars) in regal Leo, and the Dragon’s Head and Dark Moon in controlling Aries. 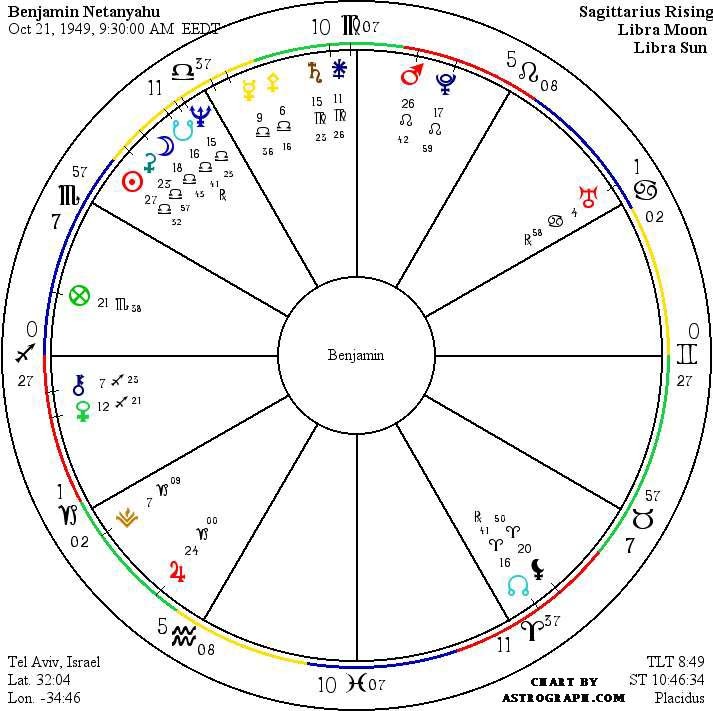 X - Returning to the Midheaven, we find the other most prominent and significant feature of his chart - Saturn. Saturn is not alone, but rather coupled with Juno which is within a degree or two of the Midheaven. Juno is the sign of the terrorist. Here Juno is in Virgo, ruler of the military. While Netanyahu has acted as an anti-terrorist fighter, created an Institute for the Study of International Terror, and written books on the subject, it seems that he may have become fixed on the subject. Thus, we come to the question of who is victim and who is victimizer, prey and terrorist. Cops and robbers have much commonality in their charts. Will Netanyahu try to pre-empt the Terrorist State of Iran like the USA did in neighboring Iraq? Will he make the Middle East safer or more dangerous and deadly? Time will tell. The clock is ticking. 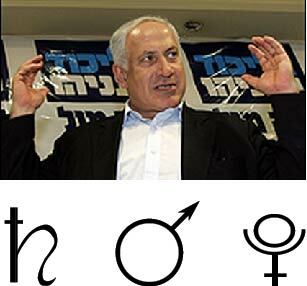 The glyph of Juno exactly at his Midheaven leads the author to wonder if Netanyahu stands their waving a flower, a sparkler or a nuclear bomb. Pluto and Juno look much the same when considered from this angle. Netanyahu: The Road to Power, Ben Caspit and Ilan Kfir, Birch Lane Press, Seacaucus, NJ, 1998.